By Wednesday 15th October 2014 large units of the Libyan National Army commanded by the Chief of Staff Abdul Razzaq Nazhuri and including Major General Hafter’s troops from Operation Dignity had entered Benghazi. As they did so they were joined by 204 Tank Brigade which had, until Wednesday, remained neutral in its barracks within thn the e city. It seems that the combined force has taken over the extensive barracks of the 17th February Brigade in the centre of the city. The 17th February Brigade has been an ally of the Islamist Ansar Sharia Brigade and Raafallah Al-Fahati Brigade which have dominated Benghazi for some considerable time. Speaking on Sky News (Arabia) on 15th October the Libyan Prime Minister, Abdulla Al-Thinni, stated that the successful routing of Benghazi’s Islamist Militias which had combined under the banner of the Benghazi Revolutionaries’ Shura Council (BRSC) was ‘part of a plan, devised by the state and executed by the Chief of Staff Abdul Razzaq Nazhuri’. It is clear that this is the first attempt by the elected government of Libya to assert its control over Benghazi which has hitherto been dominated by Militias. Reuters reports today that ‘Special forces commander Wanis Bukhamda told Reuters the area of the [Benina] airport was under full army control after Ansar al-Sharia – blamed by Washington for an assault on the former U.S. consulate in 2012 which killed the American ambassador – fled.’ There was still some fighting in the city according to sources but it seems that the Islamist forces may have been overwhelmed. Large numbers of Libyan National Army units were still entering the city on Thursday 16th October. There are reports of Sudanese fighters amongst the Islamist militias some of whom may have entered Libya via Darfur and Kufra in the south east. Reliable eyewitness reports are awaited but it is interesting to note that Bernardino Leon, the head of the United Nations Support Mission in Libya, has stated that Isis jihadists are already present in the country and awaiting their opportunity. Major General Khalifa Hafter, the leader of Operation Dignity, has also indicated that his intelligence people have confirmed that there are numerous foreign jihadists present in Libya. The Presidency Council has congratulated the Libyan National Army for eliminating the so-called Islamic State (IS) and allied militants in Benghazi. In a statement today, Wednesday, those fighting IS throughout the country were commended, but there was special mention of the military forces in Benghazi fighting against IS. In the statement, the Presidency Council said that there had to be united efforts to fight IS across the country. It mentioned in particular Sabrath and the Sidra area. Presenting its condolences to the families of those murdered by IS in Benghazi, Sirte and Derna and elsewhere, the council praised those who had understood the threat and decided to stand up to IS. It encouraged others to do so, while at the same time urging the House of Representatives (HoR) to meet and approve the national unity government. The statement pledged that the government would rebuild Benghazi and other places that suffered in the fight against the extremists. The military, too, would be supported in line with the Libyan Political Agreement, and the borders would be secured. Despite the optimism expressed on 20th April 2016 the Islamist extremists held out in Benghazi supplied and supported by allies across the Gulf of Sirte in Misurata. In the meantime Khalifa Hafter has been promoted to Field Marshall and Bernardino Leon has been replaced by Martin Kobler as UN Special Representative. The return of relative peace in Benghazi has been emphasised by the welcome news that the international high street stores, Marks and Spencer, Next, Mango and Aldo are all in the process of reopening. ‘White flags have been raised today in the remaining rebel-held buildings in the Busnaib area of Benghazi’s Ganfouda district following an attempted breakout by Islamist militants. According to a Saiqa (Special forces) official, a convey of cars attempted to flee as the Libyan National Army (LNA) attacked what is known as “12 Buildings” in Busnaib at 6am this morning. Saiqa apparently killed three of the militants in the ensuing firefight which led to the remaining combatants retreating back to the area. Some, though, may have escaped. During the fight, the LNA reportedly managed to seize eight buildings in the district and, according to an LNA official, to free some more people held captive by the militants. He confirmed that white flags had been seen in the remaining buildings, although it was unknown whether the militants or members of their families or any residual prisoners they might continue to hold were responsible. However, clashes were still taking place, the official told the Libya Herald. It had been claimed by the LNA that Busnaib was liberated ten days ago. Ganfouda was declared completely free two days ago when it was also announced that over the previous 48 hours the LNA had released some 60 women and children from the militants. Colonel Mismari has just suggested that the war in Benghazi is over after 33 months of fighting and around 4,000 Libyan National Army personal killed. He states that: “Only 70 terrorists remain in a block of 12 buildings in Ganfouda and a dozen square-kilometre zone downtown in Sabri and Suq Al-Hout.” He argues that the terrorists are now surrounded and unable to receive reinforcements and resupply. In order to save further damage, they will now be allowed to surrender or “kill themselves in attempted suicide attacks”. In the midst of an incipient civil war Libya’s newly elected House of Representatives has met in Tobruk and assumed the burden of power. Tobruk is over 1,000 kilometres to the east of Tripoli where the Islamist Misratan forces have launched ‘Operation Libyan Dawn’ against the Zintani militias occupying the International Airport. Not so far away from Tobruk the forces of Major General Khalifa Hafter have been engaged in ‘Operation Dignity’ attempting to remove the Islamist Ansar Sharia and its allies from Benghazi. The House of Representatives has today ordered all warring militias to cease fire within 24 hours. The UN will monitor the ceasefire and action will be taken by the House if the order is disobeyed. I hasten to add that Hafter’s own forces may not be funded in this way though he would be wise to reveal his backers in order to demonstrate his independence. It is also noted that Hafter has the support of the Libyan Army Special Forces and the Libyan Air Force in Eastern Libya. How will the House deal with this anomaly? Will the House have the courage and the clout to stop pay-rolling forces bent on destroying the democratic process? Does it have sufficient forces at its disposal to face down the heavily armed militias? Libyans have been taking to the streets to demonstrate against the escalating violence. A recent demonstration against the Islamist militias took place in Benghazi. It is noted, however, that a large street protest has recently taken place in Misrata in support of the Operation Dawn. I suspect the House of Representatives will stand or fall on the outcome. Sami Zapita has just written this report for The Libya Herald. ‘The House of Representatives (HoR) passed a law today disbanding all officially recognized and funded militias formed after the 2011 February revolution, including Joint Operations Rooms.The law was voted for by 102 out of 104 Representatives’. The recent skirmishes in and around Benghazi between Islamist militia brigades and the forces of Operation Dignity have brought a number of interesting developments to light. Firstly it is clear that Libyan House of Representatives has no armed forces at its command and is thus impotent in the face of the well armed militias now at war with each other. The Libyan Chief of Staff, Abdulati Al-Obeidi, has confessed that the Army proper is near collapse and the Libya Shield militia brigades, nominally under his command, are now completely beyond his control. The Islamist forces within Benghazi are made up of the Ansar Sharia Brigade, Libya Shield No. 1, Rafallah al-Sahati Brigade and 17th February Brigade. They are well armed and receiving supplies from outside, mainly from Misrata. There is a propaganda war afoot and the Islamists have managed to gain control of a number of media outlets. The forces of General Khalifa Hafter’s Operation Dignity do not appear to be unified at the moment. One of their main allies, the Libyan Army (Saiqa) Special Forces commanded by Wanis Bukhamada has been forced out of Benghazi and has regrouped in and around Benina airport. It is reported that Hafter believes it to be ‘no longer fit for purpose’ and it has been disgraced by reports of torture and brutality. Bukhamada and his staff are said to be in Tobruk. Reports of heavy clashes in and around Benghazi have been accompanied by rumours of bombing runs made by foreign aircraft on behalf of Hafter’s Operation Dignity. This is an interesting development. The rumours have not been substantiated and are thus specious. No foreign power appears to have admitted to involvement. There may, therefore, be a sinister reason for the rumours. The Islamists are conducting a propaganda war and they may be planting rumours about foreign involvement, something which would arouse very strong feelings of resentment amongst many Libyans. I note that the Algerian Air Force has 34 SU-24MK. Reports from the southern city of Sebha suggest that a delegation of Misratans accompanied by others from Gharyan and Zliten attempted to persuade the Municipal Council to back Operation Libyan Dawn. It appears that the deliberations were interrupted by armed militiamen apparently from the Awlad Sulaiman tribe. The Awlad Sulaiman have for some time been restive about the presence of Misratan forces stationed Sebha following recent intertribal clashes. ‘[Tarhuna]….rejected all decisions made by the HoR, especially the request for foreign intervention in Libya. Calling it a “flagrant violation of the sovereignty of Libya and a betrayal of the will of the Libyan people”, the statement inferred that the strikes carried out by warplanes against Operation Dawn on Monday morning were the result of the decision.’ The town, and presumably the tribe, has withdrawn its support for the new House of Representatives. LIBYA – ELECTIONS IN A HEAT WAVE II – WHO WILL WIN AND DOES IT MATTER? Preliminary results for the Libyan elections for the new House of Representatives which will sit in the Tebesti Hotel in Benghazi have just now been announced. My own superficial and inexpert assessment of the result favours Mahmoud Jibril’s largely secular National Force Alliance rather than the Libyan Moslem Brotherhood’s Islamist leaning Justice and Construction party. However the majority of candidates were required to stand as independents and whilst the list has been published it is very hard to say accurately which of the rival parties the winners will support in practice. The Islamists are saying that they have the support of the majority of independents. A number of observers also appear to be cautiously forecasting a victory for the secular candidates over the Islamists. We will see, but it may take time for the horse trading to end and the political composition of the new Libyan House of Representatives become clear. Perhaps the recent escalation of violent attacks by Islamist militias is a sign that think they have failed to gain enough seats to control the House and wish to make military gains before it meets. Ansar Sharia has just mounted an all out attack on the forces of Major General Hafter in Benghazi and the Islamist Misratan militias have renewed their attack on the Zintanis at Tripoli’s International Airport. I suspect that the Libyan Islamists will not readily accept the will of the people as expressed in the ballot held on the 25th June, unless they win. 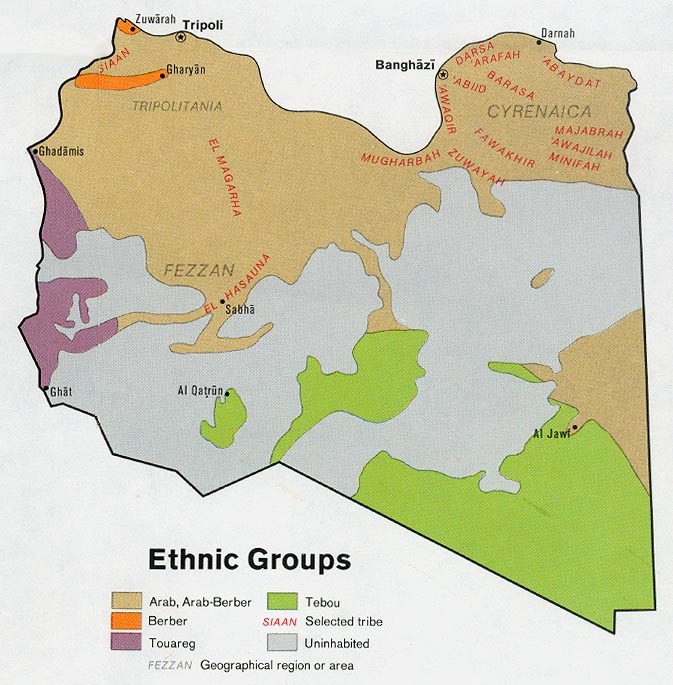 In his paper, The Role of Tribal Dynamics in the Libyan Future, Arturo Varvelli of Italian Institute for International Political Studies, proposes an impossible and near unique trilemma which the people of Libya must somehow accommodate in order to function as a nation. As I understand it, he argues that the coexistence of Islam, democracy and a rentier state has never been successful. It is, he seems to argue, just possible to implement some democratic principles in an Islamic state. I too argue that in practice the separation of Islam from popular democracy is not easy to achieve. Both the holy Koran and the authenticated saying of the Prophet Mohamed contained in the Sunna are silent on the matter of representational ‘western’ democracy. Some Muslims argue that the democratic process has its roots in ‘Shura’ or consultation. In effect this suggests that Shura is usleful but only when there is no guiding text in the Koran or the Sunna. The growing Salafist movement, however, rejects all such debate, arguing that what is not accounted for in the core texts is un-Islamic and thus outlawed. Arturo Varvelli argues that the rentier state, one which derives most of its income from oil and gas, does not encourage democracy. He and others suggest that rentier states do not need to tax their people who consequently have no incentive to exert pressure on government to respond to their needs. We might upend the inspirational catch phrase of the American War of Independence – no taxation without representation – and suggest that democracy withers without taxation. Varvelli offers the examples of the Gulf States such a Qatar, The United Arab Emirates and Saudi Arabia to show that a rentier state which is at the same time an Islamic state cannot also be a truly democratic state. The common factor that these states share is the presence, so far at least, of an hereditary ruling family; the House of Al Thani in Qatar, the eponymous Ibn Saud and in the UAR, Al Nahyan and Al Makhtoum amongst others. Gaddafi’s efforts to establish himself and his family in a similar role in Libya failed spectacularly in 2011, probably because of his serious character flaws, the low esteem in which his tribe is held and his suppression the Libya Islamists. It would seem then that the brave attempt to elect a House of Representatives may not be the final solution to the Libyan trilemma. These well researched pieces in Al Jazeera English may prove interesting reading for those who seek a more detailed analysis. and this excellent piece from the BBC.